Our shipping season has ended and we are not able to accept any more orders for this season. Please check back September 2019 to see our online catalog for the next shipping season which will begin January 2020. Good drainage is one of the most important factors in cherry tree success. If your soil does not drain well and you have your heart set on growing cherry trees, consider constructing a raised bed. You can use lumber or railroad ties to enclose the bed and fill it with a good mix of top soil and soil amendment. Just before those delicious red (or in the case of Rainier, yellow with a red blush) fruits are ready to harvest, the birds descend! If your cherry tree is very large, there may be enough to share. If not, you will most likely want to net the tree. We offer bird netting in our Orchard and Garden Supplies section. Another option is constructing a permanent net made of chicken wire. Make sure there is an opening for easy entry. You probably will want this type of structure in an unobtrusive spot. Before the Second World War, more than fifty varieties of sour cherries were grown, but now few are grown commercially. It seems they have been somewhat neglected in the breeding programs since sweet cherries are so much more popular. Sour cherry trees are usually smaller than sweet cherry trees and their branches are more twiggy. They are also more tolerant of heavy soils and will fruit on younger wood. Although they are usually grown as standards, they can be left as small bushes, making the harvesting and netting much easier. Dead, diseased and congested growth should be removed in spring or early summer. When harvesting the cherries, it is best to cut them off the tree. They bear on spurs for many years and there is a possibility the spurs will come off with the cherries. Morello cherries freeze very well. They can be frozen without sugar and retain their flavor. Sour cherries make great pies, tarts, cakes and jams. Sweet cherries freeze better if the pits are removed. Eating cherries is one of summer's great delights. Who knew that something so delicious could be so good for you? Wood of the sweet cherry is greatly prized by furniture makers and it is also an aromatic addition to your fireplace. The trees themselves add beauty to the landscape, especially when they are flowering. The white blossoms appear in clusters and the appearance is that of a tree covered in snow. Line a 9” pie pan with pastry crust, from the edge into a fluted standing rim, brush with lightly beaten egg white and chill in the refrigerator. Mix with 1 ½ cups of scalded milk flavored with a few drops of vanilla. Beat briskly while pouring the milk to prevent curdling. Stir in 1 ½ cups of pitted sour cherries (marinated in a few tablespoons of cherry brandy if desired). Pour filling into pie shell; bake for 10 minutes at 400 degrees. Reduce the heat to 350 and bake 25 to 30 minutes longer. Do not chill. Wash 5 lbs. of sweet cherries thoroughly, removing the pits. Squeeze 3 medium sized lemons, combine with cherries and simmer gently for 30 minutes. Warm 3 ½ lbs. of sugar, add to cherries over low heat and stir until dissolved. Bring the jam to boiling until it sets, about 15 minutes. Test with a thermometer; the temperature should reach 224 degrees. Cool for 5 minutes. Follow directions for processing jam. 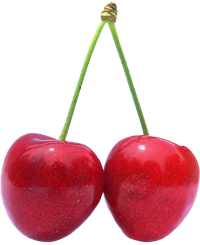 In heavy soils, standard cherries are dwarfed to about 22 to 30 ft. Lesser dwarfing effect in other soils. Relatively tolerant of wet soils, apparently resistant to bacterial canker. Trees begin bearing at a young age. Trees on Colt may be held to any desired height by summer pruning. The most winter hardy of the commonly used cherry rootstocks. Resists crown gall, bacterial canker, some nematodes. Not tolerant of wet soils. Standard varieties slightly dwarfed to about 85% of their height on Mazzard, or about 25-35 ft. Can be held at any height with summer pruning. Induces early, heavy bearing. Cherries are dwarfed to 2/3 of standard, about fifteen feet. Very precocious and productive. Extensive root system with good anchorage. Tolerant of wet soils. Resistant to nematodes, bacterial canker and iron chlorosis. Very little suckering. Standard rootstock for sweet cherries; unpruned tree height of standard varieties is 30-40 ft.; trees may be held to any height with summer pruning. Vigorous, more tolerant of wet soils than Mahaleb, but good drainage still required. Resistant to root knot nematodes and oak root fungus. Well anchored. Relatively cold hardy. New cherry rootstock from Zaiger Genetics. Very dwarfing; unpruned trees grow to about twelve feet. Perfect for container growing and adaptable to many soil types. Formerly known as New Root 1 and tested as 3CR178. Dwarf sour cherry is attractive, densely foliated, naturally small tree growing to about 8-10 ft. Large, meaty, tart, red skinned cherry with red juice is excellent for pies and cobblers, also used fresh when fully ripe. Hardy to -40 degrees F. Very productive, often bears in second year. Resists cracking and brown rot. Ripens early to mid June in central Calif., a little later than Montmorency. 500 hrs. Self-fruitful. Available on Mah. Large, firm, juicy, sweet cherry, nearly black when ripe. Has superb flavor, the number one cherry. Ripens late May to mid June. Large, vigorous tree. 700 hrs. Pollenized by Black Tartarian, Lapins, Van, Rainier, also Stella in colder climates. Available on Mazz. Large, firm, juicy, sweet cherry, nearly black when ripe. Has superb flavor, the number one cherry. Ripens late May to mid June. Large, vigorous tree. 700 hrs. Pollenized by Black Tartarian, Lapins, Van, Rainier, also Stella in colder climates. Available on Max. Medium sized, nearly black, sprightly flavor. Vigorous, productive tree. Ripens in mid to late May. 700 hours. Pollenizer required; interfruitful with all popular sweet cherries. Zones 5-7. Available on Mazz. 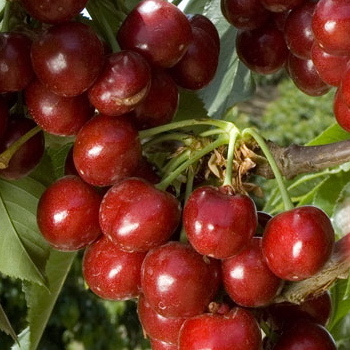 Excellent genetic semi-dwarf, self-fruitful sweet cherry; winner of recent taste test. Medium to large, firm, dark red to nearly black fruit has wonderful, spicy flavor and firm texture. Ripens mid to late May. 5-600 hrs. Pat. No. 7320 (Zaiger). Available on Max. Self-fruitful cherry from Canada. Large, firm, dark red sweet cherry with good flavor. Fruit not prone to splitting. Ripens in early June, 4 days after Bing. 400 hours or less. Self-fruitful; good pollenizer for other cherries. Available on Mazz. Self-fruitful cherry from Canada. Large, firm, dark red sweet cherry with good flavor. Fruit not prone to splitting. Ripens in early June, four days after Bing. 400 hours or less. Self-fruitful and a good pollenizer for other cherries. Great for containers and small gardens. Available on Z-Dwarf. Self-fruitful cherry from Canada. Large, firm, dark red sweet cherry with good flavor. Fruit not prone to splitting. Ripens in early June, 4 days after Bing. 400 hours or less. Self-fruitful; good pollenizer for other cherries. Available on Max. Medium sized red cherry with good flavor and a low chill requirement. Tree is very productive and ripens 11-14 days ahead of Bing. Pollenized by Royal Lee or Royal Crimson. Zones 8-10. 200 to 300 hours. Pat. no. 12942 (Zaiger). Available on Max. Large yellow cherry with red blush. Sweet, crisp and flavorful, superior to Royal Ann. Very cold hardy. Mid season harvest(late May/early June). 700 hrs. Pollenizer required: interfruitful with Van, Black Tartarian, Bing, Utah Giant. Available on Mazz. Large yellow cherry with red blush. Sweet, crisp and flavorful, superior to Royal Ann. Very cold hardy. Mid season harvest(late May/early June). 700 hrs. Pollenizer required: interfruitful with Van, Black Tartarian, Bing, Utah Giant. Available on Max. (Tested as 6GM25) At last, a self-fruitful low chill cherry! Bright crimson fruit with superb flavor. Interfruitful with Minnie Royal and Royal Lee. Ripens in early to mid May. Zones 8-10. 200 to 300 hours. Patent pending (Zaiger). Available on Mazz. Medium-large red heart shaped cherry is firm with excellent flavor. Tree is very productive with a low chill requirement. Pollenized by Minnie Royal or Royal Crimson. Zones 8-10. 200 to 300 hours. Pat. no. 12472 (Zaiger). Available on Max. Large, yellow cherry with slightly more red blush than Rainier. Excellent flavor, taste test winner. Ripens early, about 3-5 days ahead of Rainier. Pollenizer required: Lapins for low chill areas and in other areas, any sweet cherry. Moderate chill requirement, 500 hours estimated. Available on Mazz. Large, yellow cherry with slightly more red blush than Rainier. Excellent flavor, taste test winner. Ripens early, about 3-5 days ahead of Rainier. Pollenizer required: Lapins for low chill areas and in other areas, any sweet cherry. Moderate chill requirement, 500 hours estimated. Available on Max. Self-fruitful; no pollenizer needed. Large, nearly black, richly flavored sweet cherry similar to its parent, Lambert. Late harvest (early to mid June). 400 hours. Pollenizes Bing, except in mild winter climates. Available on Mazz. Self-fruitful; no pollenizer needed. Large, nearly black, richly flavored sweet cherry similar to its parent, Lambert. Late harvest (early to mid June). 400 hours. Pollenizes Bing, except in mild winter climates. Available on Max. A self-fruitful cherry that ripens mid to late June to extend the cherry season. The large bright red fruit has a unique taste and remains crunchy when picked. Resistant to cracking. Trademarked. Plant patent applied for. Self-fruitful. 800 chill hrs. Available on Mazz. Best sweet cherry, according to Utah folks. Larger, firmer, more flavorful than Bing or Lambert. Good canner. Does not double. Ripens late May to early June. 800 hrs. Pollenizer required: Bing, Lambert, Rainier, Van. Available on Mazz. Best sweet cherry, according to Utah folks. Larger, firmer, more flavorful than Bing or Lambert. Good canner. Does not double. Ripens late May to early June. 800 hrs. Pollenizer required: Bing, Lambert, Rainier, Van. Available on Max. Late ripening (mid June) tart cherry for cooking, sometimes eaten fresh when fully ripe. Dark red to nearly black fruit has dark juice. Small, round-headed tree has drooping branches, is easy to harvest. 500 hours or less. Self-fruitful. Available on Mazz. Large sour cherry with bright red skin and firm, yellow flesh. Has rich, tart, tangy flavor. Perfect for cobblers, pies, etc. Extremely winter hardy. Very heavy bearing; ripens late season, in June. 500 hours or less. Self-fruitful. Available on Mah. These four varieties grafted onto a single tree: Rainier, Bing, Utah Giant, Van. Available on Mazz.